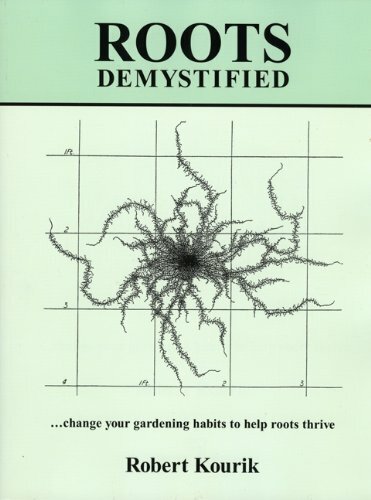 Roots Demystified explains simple solutions for growing healthy roots and, thereby, healthier plants. The book explores the subterranean part of every gardener’s world, revealing how roots really grow while correcting common errors such as where most gardeners apply water, mulch, and fertilizer or compost. This is the first and only book in print for gardeners with such an extensive number of illustrations of garden and orchard roots. The roots covered underlie lawns, prairies, shrubs, vegetables, fruit trees, and native and ornamental trees. Practical tips for how a gardener can use this information to create more abundant vegetables, better lawns, and sturdier trees and shrubs are offered with each of the 70 illustrations. Roots Demystified also describes several ways to garden without turning the soil―no-till and surface cultivation―a plus for aging baby-boomers. If you have any questions about this product by Metamorphic Press, contact us by completing and submitting the form below. If you are looking for a specif part number, please include it with your message.